There are so many components that go into a well-built home. One that should not be overlooked is solid carpentry. If your builder shies away from this important part of your new home, it may be time to look elsewhere because this can make all the difference in a well-constructed home. One of the great skills a carpenter can offer to a new home is the stairwell banister. Many people don’t understand all the hard work that must go into the construction and installation of a well-crafted banister. 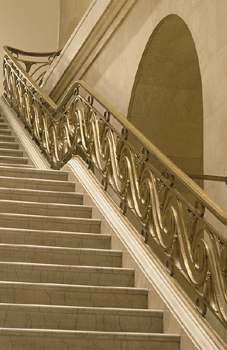 Each handrail must be sliced up into thin slices, similar to a loaf of bread, then delicately glued and clamped together, and finally sanded down to give it the unique style and sophistication that often “wows” those who enter a new home. The look of the banister is actually only a small portion of what goes into putting it into a home. In fact, the installation is just as important, if not more so, than the visual appeal. The base of the pole must be cut into the tread of the bottom stair and bolted directly into the floor joist. This gives the banister a stability that can’t be matched by any other method. Once it is securely fixed into that bottom step, it is important to firmly glue the rail into the step and then wrap the carpet or wood around for a banister that is as aesthetically pleasing, as it is secure. Properly installing a door is more than just about affixing a door to a doorframe. Center the door, take shims that will fit together and then nail it together. This needs to be done at all of the hinges for the securest fit. In addition, you should do it on the right hand side at the door’s opening at the top, bottom, and the door lock. This will allow for a door that shuts solidly, doesn’t rattle, or come open at inopportune times. Factory-Made Cabinets: These can be purchased as “boxes,” that is without the doors already installed. The “boxes” can be somewhat customized for the dimensions of your kitchen. Custom-Built Cabinets: Some builders will actually build your cabinets on site and make them to your exact specifications. You will be allowed to design your entire cabinet storage solution and the builder will create the kitchen around the cabinets you design. The internal details of the cabinets matter, too. Many are built with skinny veneer backings that are bolted to the wall. Over time, heavy contents in a cabinet can weigh it down and the cabinets themselves can actually fall. 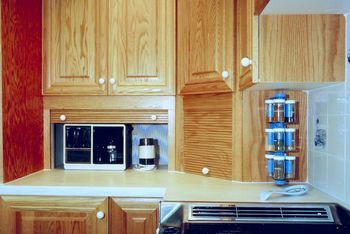 That’s why it’s important to use high quality wood throughout your cabinets. Cabinet drawers are also something that shouldn’t be taken lightly either. It’s easy, over time, for these doors to get slammed and damaged. By installing the soft close type drawers, they are protected from the harmful effects of hard shuts and the possibility of the fronts of the cabinets eventually falling off. Cabinet Lighting –Where Should it Be? • Where do you want your light switches: on the wall or under the cabinets? The answer needs to be determined sooner rather than later. • Where do you want your lighting? Under counter light or above counter lighting? Both offer visually stunning affect in many kitchen settings. There are a number of considerations when it comes to cabinetry in a new home. Careful consideration should be given to the build you select and each detail where woodworking is involved should be done to the highest quality.